Full Circle Insights enabled marketing and sales to both report on the same data in Salesforce. The CMO at AppDynamics needed insight into the business results of marketing campaigns but he had no visibility into sales follow up on MQLs (marketing qualified leads) or how each campaign played a role in opportunity creation. All leads (including list imports) defaulted to an opened status—there was no process to create leads with pending statuses or build to MQL thresholds driven by lead scoring or other factors. Marketing’s lack of insight into sales follow up on MQLs prohibited it from understanding the outcome of its campaigns. 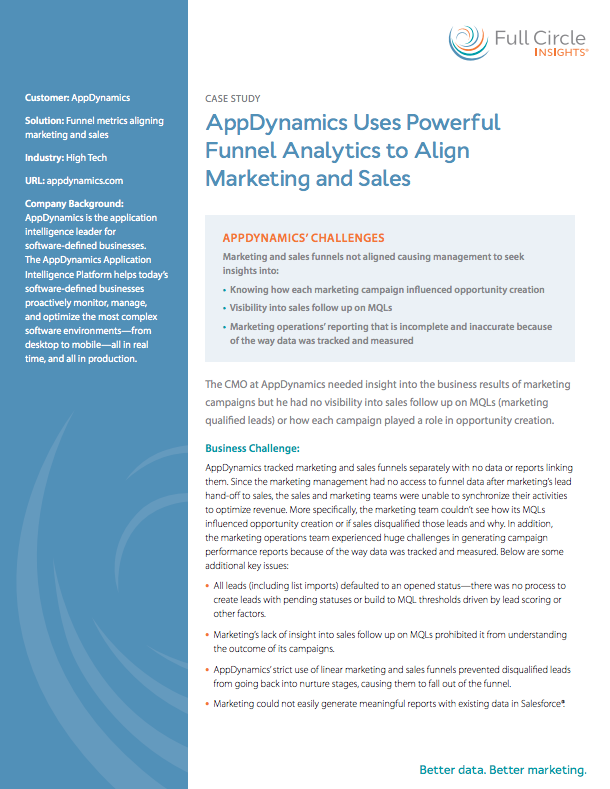 AppDynamics’ strict use of linear marketing and sales funnels prevented disqualified leads from going back into nurture stages, causing them to fall out of the funnel. Marketing could not easily generate meaningful reports with existing data in Salesforce®. After AppDynamics implemented Full Circle Insights’ Response Management solution, the data tracking and reporting in Salesforce was completely transformed. Marketing and sales now both report on the same data, in the same place, enabling marketing to see exactly what drove sales. Increased its insight into sales follow up on all MQLs generated by 100%. Marketing and sales data in the same place, instilling trust in the marketing data from sales and the executive teams. Decreased number of leads falling out of the funnel due to lack of sales engagement by 100%, enabling those leads to be put back into a nurture stage rather than being disqualified. A powerful reporting infrastructure within Salesforce to generate ad-hoc reports with ease. Download the full AppDynamics Case Study to learn how they increased sales follow up on MQLs by 100%.